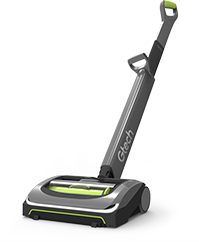 We’ve created a cordless handheld vacuum cleaner to make cleaning your home easier and more enjoyable. 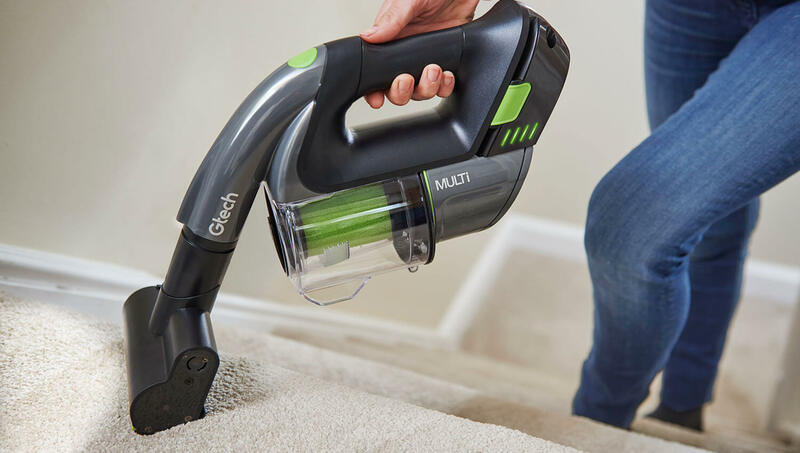 With all the attachments of a traditional vacuum, and none of the bulk, the Gtech Multi is perfect for cleaning stairs, upholstery and tight corners of your home. 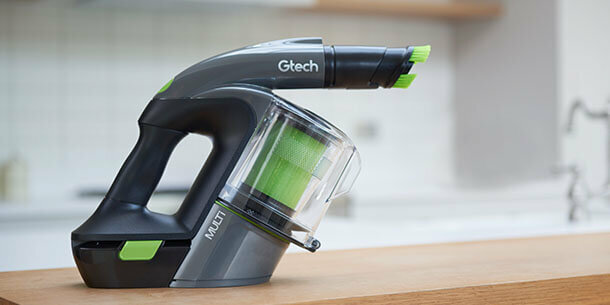 The Multi might be small but its range of versatile attachments assists you in big jobs. 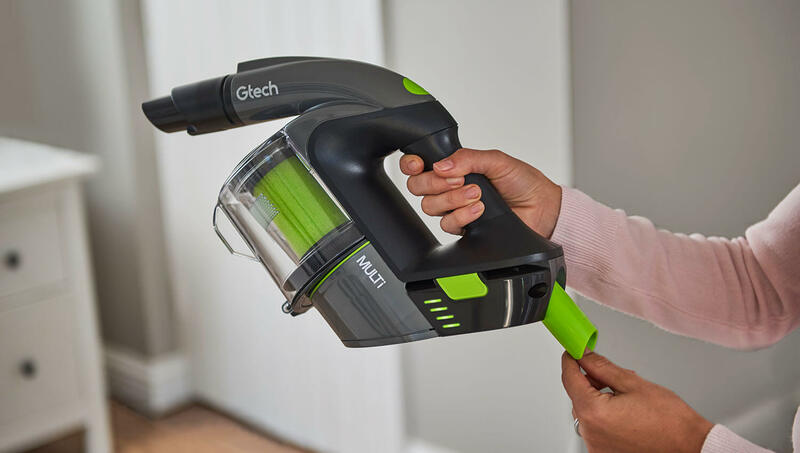 With an extension tube to add reach, you’ll be able to clean your home from floor to ceiling. 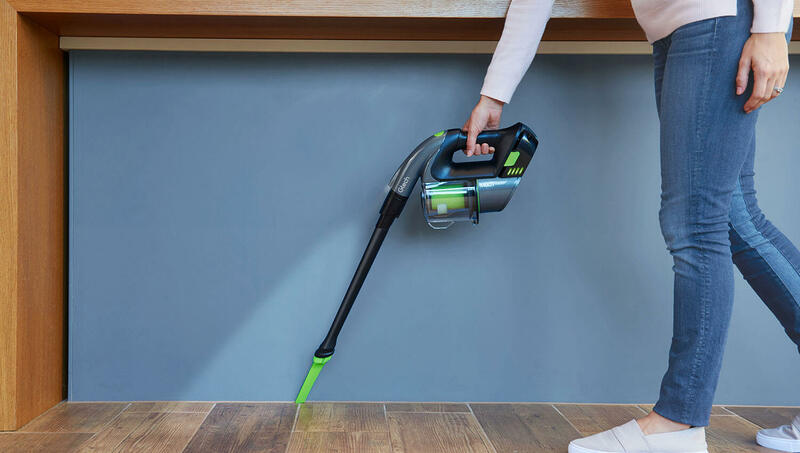 The power head makes short work of your stairs, while the crevice tool lets you clean skirting boards***, picture frames and awkward areas around your home. The dusting brush is ideal for upholstery and car interiors. 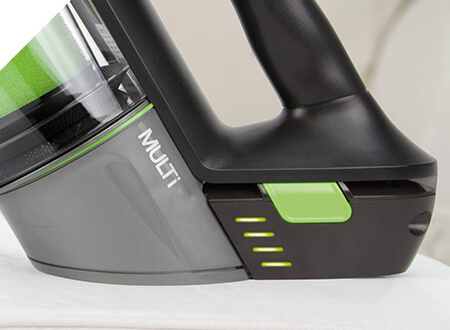 Due to its compact build, the Multi can be neatly stored away when not in use. Forget clambering through the under stairs cupboard and being attacked by your ironing board. 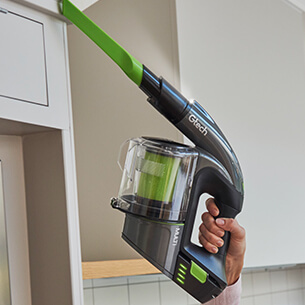 With simple storage, this handheld vacuum cleaner is always on-hand for emergency clean ups - and those spontaneous visits from unexpected guests! 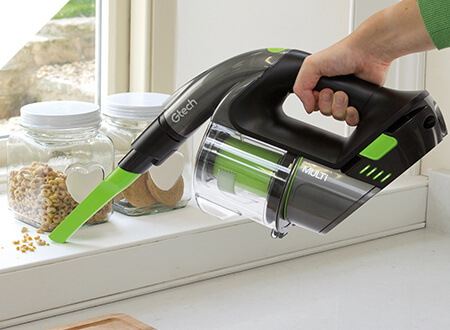 Weighing just 1.5kg**, this lightweight rechargeable vacuum cleaner can be used beyond the boundaries of your home. 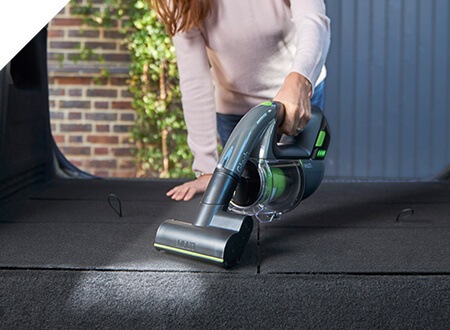 Reach into the small spaces of your car or caravan and get rid of any stray crumbs between the seats. 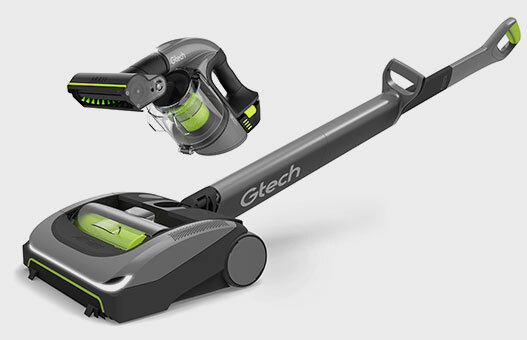 Its lack of cords means you can roam from your garage to your garden shed while you clean. 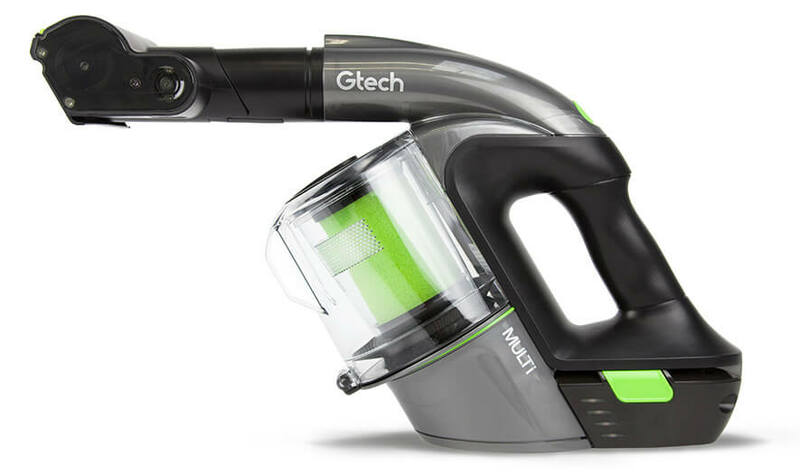 The Gtech Multi is powered by a removable 22V Lithium-ion battery, giving you up to 20 minutes of runtime with each 4-hour charge*. Check how much power is left with the handy LED display. 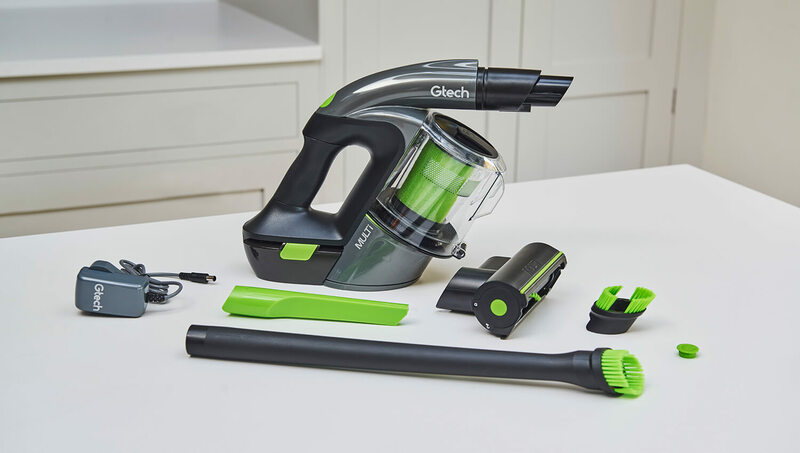 The Gtech Multi makes cleaning small spaces like the car or caravan simple, easily reaching into cracks and crevices to lift stubborn dirt. Our aim has always been to make people’s lives easier, which is why we’ve added an LED headlight to the Multi. 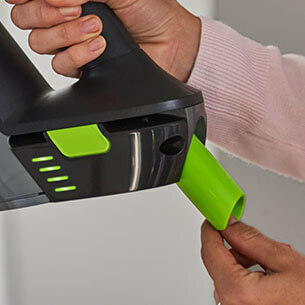 It illuminates your cleaning area, making dirt and dust will be more visible and helping you vacuum more thoroughly – perfect for awkward corners. 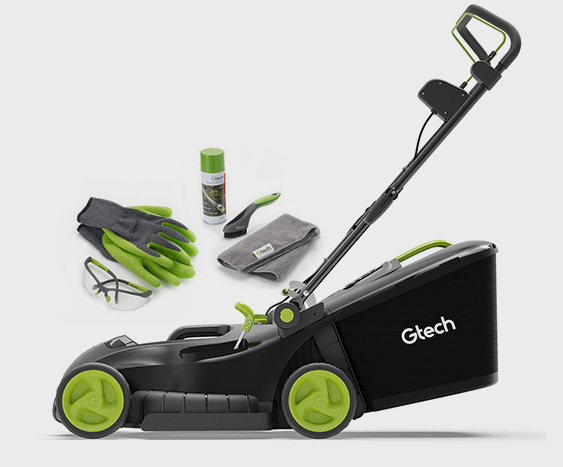 Don’t forget to add the Gtech Car Accessory Kit for more handy accessories. 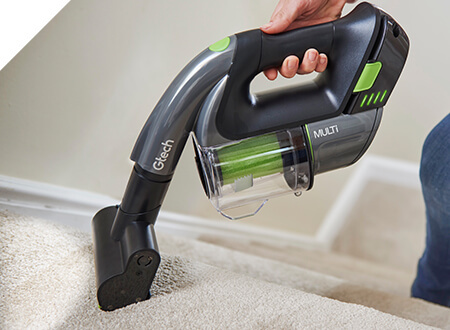 Many of us are used to the perilous task of vacuuming the stairs and the fear that comes with balancing or holding a heavy machine on each step. 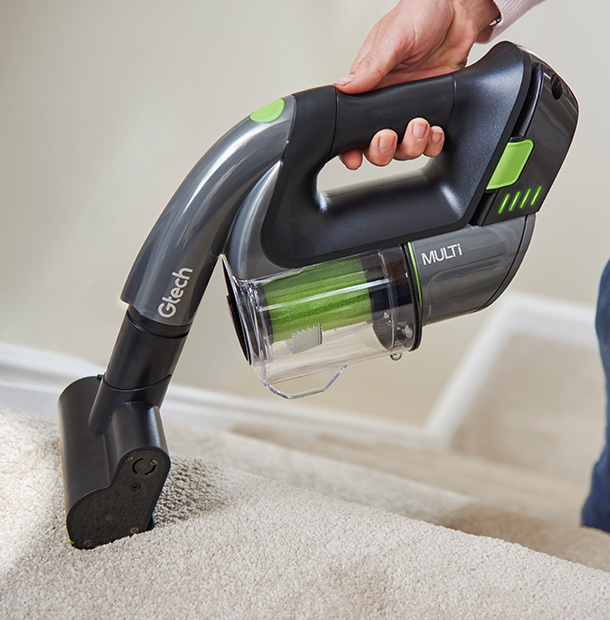 Make stair cleaning easier with this lightweight handheld vacuum cleaner and take control. 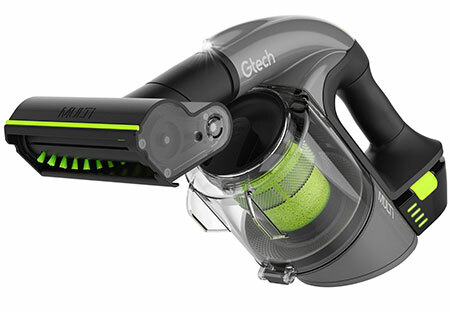 Its power head lifts pet hair, dirt and dust as you move at your own pace. Satisfying as it is to see the results of your cleaning job, we’ve kept the Multi’s waste disposal system easy to empty on a regular basis. 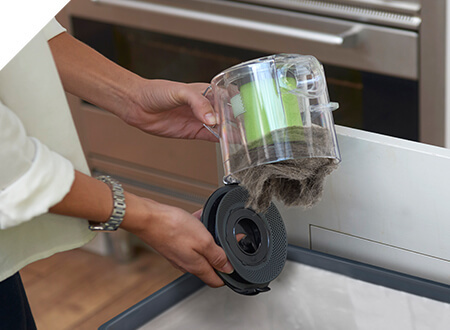 Dirt and debris is released with a simple flip of a latch, letting you get back to enjoying your home. 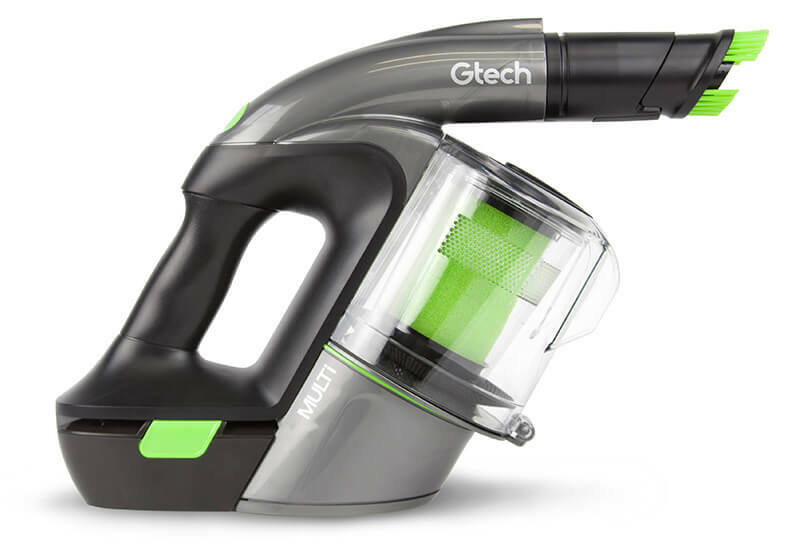 With its sleek, streamlined design, this portable vacuum makes cleaning less of a hassle. 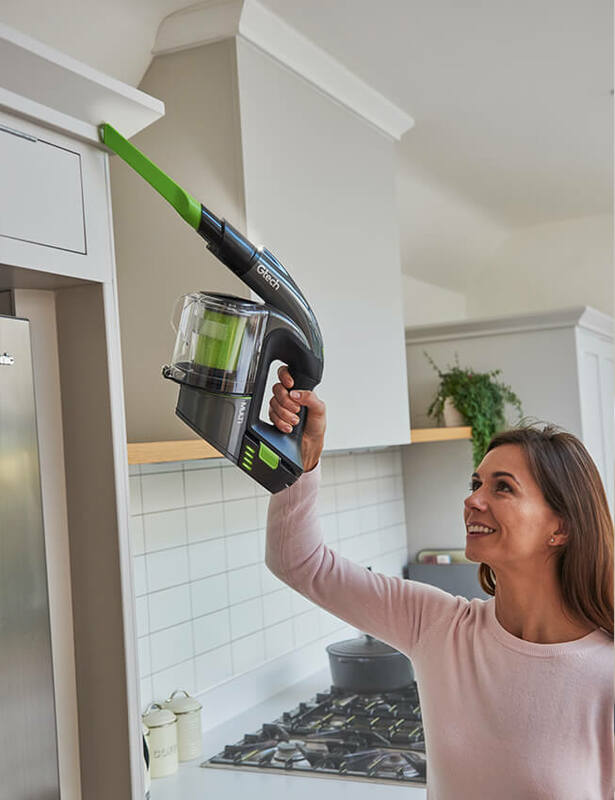 Emergency tidy ups, serious spring cleans and everything in-between can be done easily with this lightweight rechargeable vacuum cleaner. Perfect companion to the AirRam 2. 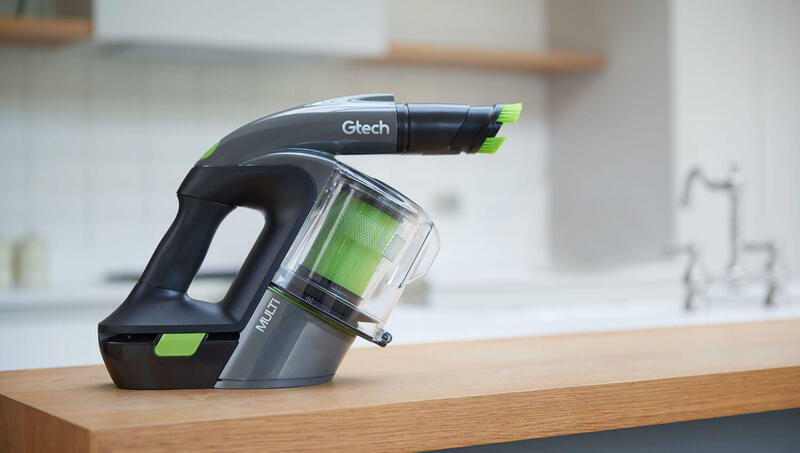 Ideal for cleaning up cat hair from the furniture and good for hard to reach areas. Wish we had bought it last year along with the air ram! We are very pleased with our new 'hand held' Multi! We have bought several in the past few years. Love this for my sofa and stairs as already had the air ram for 2 years. Brings my light coloured sofa up like new. I've had this 10 minutes, so how can I give a proper review???? So far so good. I have no idea about battery life or battery degradation as I've used it for 5 minutes. 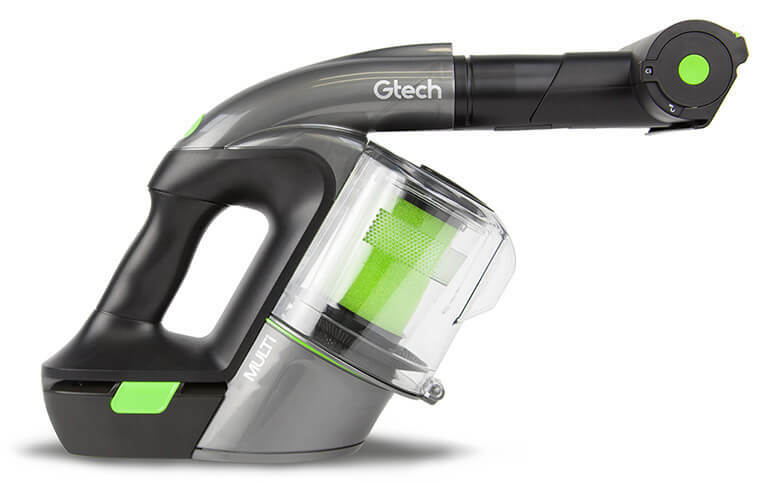 you will be notified when Gtech Multi MK2 is back in stock.